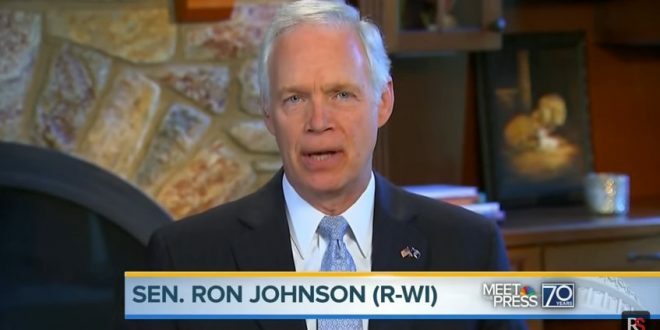 GOP Sen. Ron Johnson: McCain's Vote On Obamacare Repeal Might Have Been Affected By His Brain Tumor - Joe.My.God. Republican Sen. Ron Johnson of Wisconsin said Tuesday that he thinks that Sen. John McCain’s brain tumor and the early morning hours may have affected the Arizona Republican’s no vote on the Senate bill to repeal Obamacare. “Again, I’m not gonna speak for John McCain — he has a brain tumor right now — that vote occurred at 1:30 in the morning, some of that might have factored in,” he continued. Seemingly shocked, a radio host responded “really?” to Johnson’s comments.